Dominik Hasek played 16 seasons in the NHL. He played for the Chicago Blackhawks, Buffalo Sabres, Detroit Red Wings and the Ottawa Senators. From 1993 to 2001, he won six Vezina Trophies. In 1998 he won his second consecutive Hart Memorial Trophy, becoming the first goaltender to win the award multiple times. While with the Red Wings in 2002, Hasek became the first European-trained starting goaltender to win the Stanley Cup. In the process, he set a record for shutouts in a postseason year. 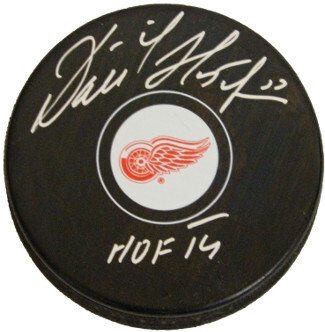 Dominik Hasek has hand signed this Detroit Red Wings Hockey Puck with HOF 14 Inscription. Schwartz Sports Hologram and Certificate of Authenticity from Athlon Sports.